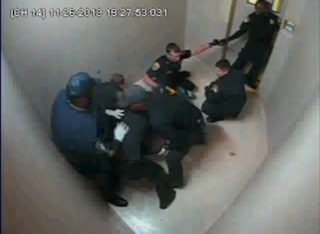 Officers surround Ervin Leon Edwards (not visible) in an attempt to restrain him. Ervin Leon Edwards died lying facedown on the floor of West Baton Rouge Parish Jail in Louisiana. According to The Advocate, the 38-year-old’s 2013 death has since raised questions. A recent video released from the jail shows that Edwards was surrounded by about six officers, who appeared to be attempting to subdue him, in the small cell. At times Edwards appeared to be struggling, while at other times he seemed to be compliant. Then a police officer used his Taser on the Jennings, La., native, and Edwards stopped moving altogether. One by one the officers left the cell. A handful of times, jail officials appeared to look into the window of the cell door, but no one actually returned to the cell to check on the inmate, who still had not moved. Approximately 10 minutes went by before deputies and officers went back into the cell to check on him, The Advocate notes. It is that time gap in the welfare check that is the cause for concern. “The fact that the subject appeared unresponsive, perhaps unconscious, on the floor as the officers withdrew from the cell should have resulted in an immediate request for medical intervention and a quick determination of whether there was a pulse or breathing,” Greg Meyer, a former captain at the Los Angeles Police Departent, told The Advocate. “If not, CPR should have been started immediately. “When someone appears unconscious, you need to get medical attention,” he added. An internal review by the West Baton Rouge Parish Sheriff’s Office found that there was no criminal wrongdoing by any of the officers involved in the incident, but the office has since turned over its investigative findings to the Department of Justice, The Advocate reports. Edwards was arrested after a “minor argument” with his girlfriend at a gas station, a wrongful death lawsuit filed in February 2014 claimed. Law enforcement responding to the dispute allegedly arrived after the argument was over, but deputies allegedly began to question the 38-year-old about his “sagging” pants, the suit added. Edwards was then arrested. After Edwards died on the jail-cell floor Nov. 26, 2013, his cause of death was said by investigators to be “undetermined,” but an autopsy report listed “acute cocaine and phencyclidine (PCP) intoxication in association with restraint by law enforcement,” according to The Advocate. Meyer said that Edwards’ death was probably due to “excited delirium,” which would essentially mean a combination of drug intoxication, restraint efforts and his overall health, according to The Advocate. But some are also questioning whether officers should have been warned that Edwards might be more affected by certain restraining methods because of his physical and mental condition. His family said that he was partially deaf and suffered from high blood pressure and a mental disability. He was also morbidly obese, according to the death report.